Finally, I have gotten around to doing what I love doing. Reviewing one of the great new CSR reports to be issued in the past few months. The SAP 2009 Sustainability Report. It was hard to miss the commotion around the launch of the SAP report, proclaimed by many as the most innovative and forward-thinking, hi-tech, interactive and engaging report in the history of CR reporting. I have bounced in and out of the online report a few times, findng the online format a touch cumbersome to navigate, despite its objective of delivering a compelling interactive experience. Now it's time to take a deeper look, and whilst I am at it, consider just how much interactivity this interactivity pioneer has interactivated in its first few months of issue. Let's do it this way: 5 things I like about the SAP report. and 8 things I dont ..err... 8 things I like less. Good news first, as always. The Tour of the SAP 2009 Sustainability Report. If you can't be bothered to read the whole thing, then 7.43 minutes of highlights and insights for a Magical Mystery Tour of this report is time well spent. Nicely done. An Executive Summary on video. The open feedback facility on every page. "Issue Experts" and other SAP people conduct open dialogue in response to feedback and queries so that all of us folks who thought it and didn't feedback it can get the benefit anyway. Very nice feature which I hope will be adopted by many other Companies. Comments are not moderated which demonstrates great transparency in this Brave New CyberSpace World. It kind of turns the report into one long blog. Hmm. Now there's an Idea ... a Sustainability Report in the form of a BLOG. What a great thought. Remember: you saw it HERE first. Also, when you post a comment in the SAP report, a pop-up enables you to share your comment to Twitter, FB and LinkedIn. Nice feature. The SiteMap: This is about the best way to navigate this report, enabling an overview of the different sections. It is, in effect, the Report content list. The Advisory Panel Statement: I liked this statement, finding it to be balanced and astute in its commentary on SAP's advances in sustainability processes and also the limitations of this report. This adds a degree of credibility to Sap's efforts and reporting. No download: I find it soooo tiresome and time-consuming reading reports on line. Online reading is ok for blog posts and other articles with short bytes. The SAP report is long enough to make me tire of the online version after half a dozen clicks. Sorry SAP. A PDF download, as an additional option, is a format which I find much easier and much more efficient for reading the entire report. The online is great for dipping in and out but makes for a disjointed reading experience as moving around is interrupted with click and wait to load the page. Drives me insane. I like to work fast and totally online reports often slow me down and this SAP report is no exception. Feedback feature: When you go to enter comments, the comment box expands and overrides the page you want to comment on. Since I turned 21, my memory just ain't what it used to be, and if I cannot see what I am commenting on, I forget what I wanted to say. Yep, fact of life. I had to comment with the report open in two web pages, and toggle between them. Rather tiresome. The Sustainability Map: This is a product marketing brochure for SAP solutions. It looks nice and organized well, but it's promotional rather that substantial. It's not reporting the IMPACT of SAP's sustainability solutions, it's describing SAP's offerings. I believe SAP must think in terms of measuring the way the company is creating a difference in the market place and reporting on that, rather than focusing on the way it maintains a presence. It's Boring: This report may be interactive, but it is boring. The style and tone is dry and consists of mechanical, descriptive, often technical commentary. Where is the true spirit in this report? It seems to be taken up in the self-congratulatory smugness of the online presentation rather than the way sustainability comes alive at SAP. Where are the SAP employees in this report? What about a few faces and names of key players (beyond vids of the CEO's and Sustainability Director)? A few case studies. Anecdotes. Chunky Monkey. Something to inspire. It's shallow in key areas: The report content doesn't dive deep enough into core issues that are of critical importance to SAP's culture and development as a sustainable business. The section on Women in Management does not adequately explain why SAP's results are consistently poor despite a string of initiatives to make women superwomen. The section on Employee Engagement which dropped 84% to 69% in 3 years - an alarming result - a third of the workforce are not engaged - doesn't inspire confidence that SAP knows how to address this as an organization. Customer Satisfaction declined by two percentage points from 93% to 91% in 2009. Is this significant for SAP? The commentary does not really describe specific efforts that will ensure higher levels of satisfaction in the future aside from a change to customer service options and no increase in service fees. It's tactical not strategic: This Sustainability Report gets high marks for transparency and interactivity. However, it is focused on SAP inputs and not outcomes. Despite spending rather a lot of time in the report, I still fail to get a clear substantiation of the contribution SAP is making to advance a sustainable society. The few case studies from Lexmark, Rohm and Hahs and John Deere do not really provide clear measurable benefit, they are more like technical specifications for software solutions. This report lacks a concept and a theme which tells the story of SAP's sustainability. The Advisory Panel says that SAP has unambiguously embraced the role of enabler. Well, frankly, if they hadn't made this point, I am not sure anyone would have got it. SAP needs to stand back from the technological magic and think about what they really want to use this report for and how to project their real contribution, beyond making money. No Sustainability Action Plan: Contrast this report with the "we said, we have, we will " of master-reporters Vodafone and you realise that the SAP report really does not achieve clarity about its sustainability journey. I wasn't able to get a sense of overall plan, performance against that plan, or quantifiable future targets. Maybe I just got tired of clicking and waiting. elaine cohen, CSR consultant, Sustainabilty Reporter, HR Professional, Ice Cream Addict. Contact me via www.twitter.com/elainecohen on Twitter or via my business website www.b-yond.biz/en Beyond Business Ltd, an inspired social and environmental consulting and reporting firm. An excellent article in The Guardian.co.uk called "Stand Up to Unilever's hypocrisy over skin lightening" followed by a long thread of comments, largely disagreeing with the author, prompted me to think about the essence of CSR and the responsibilities of companies to align their messages with all their brands. Unilever has been targeted for some time with charges of hyprocisy - one the one hand, promoting self-esteem and "real beauty" for women with Dove, whist on the other hand, denigrating women with sexist and humiliating ads for Axe deodorant, and now with skin whitening offers via Vaseline brand to encourage people to represent themselves on Facebook with lighter skin, which doesn't quite align with the concept of "real" beauty. Is this hypocritical or is it just horses for courses in the aggressive competitive beauty industry? Unilever (disclosure: I worked for Unilever in the role of VP for Human Resources in Israel for 8 years) is highly regarded as a leader in CSR. Just this month Unilever was recognised by Business in the Community as the Company of the Year. Unilever has been a consistent CSR reporter for years and years - you can view their latest 2009 Sustainable Development Report here. Unilever sources tea from Rainforest Alliance Certified Farms, and palm oil with GreenPalm Certificates, and 44% of Unilever's food portfolio is in line with internationally accepted guidelines for saturated and trans fat, sugar and salt. 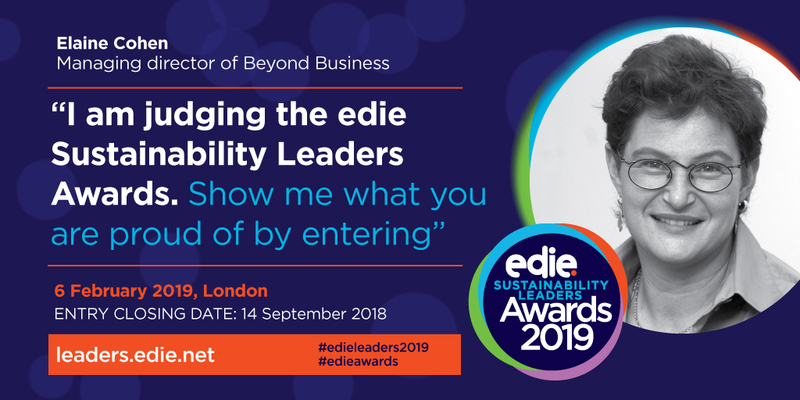 A DowJones Sustainability Index Industry Sector leader for the 11th year running and a UN Global Compact signatory, Unilever consistently reduces its environmental impacts whilst helping people to look good, feel good and get more out of life. Unilever say: " We are committed to responsible marketing ." Examples quoted are the successful campaigns related to Dove and Omo and the awards that Unilever has received for good marketing and advertizing campaigns. And good they are. But doing good is not a license to do bad elsewhere. Unilever, originally the merger of two Companies, the Dutch Unie and the British Lever, has worked hard over the past 5 years or so to create One Unilever - the dismantling of the dual CEO structure which characterised this corporation for decades. There appears to be one part of the Company which has not made this transition quite so smoothly - the marketing division. It really is not acceptable to enhance self-esteem with one campaign and destroy it with others. Needless to say, these issues are not addressed in Unilever's voluntary CSR reporting which is rather good-news oriented. So come on, Unilever, get your One Unilever act together and stop allowing unprincipled and irresponsible marketing campaigns to tarnish your otherwise impressive CSR and sustainability record. Get the concepts embedded. Get the Marketing people on board. Rewite the marketing manual. Do more Doves. Betting on a sustainable (MBA) future? My most recent post on Green MBA's , which follows my editorial on CSRwire.com entitled "Will Green MBA's save the planet?" relates primariliy to the recruiting practices of corporates who talk sustainability but blithely ignore the thousands of Green (sustainablility) MBA grads who enter the job market each year. As I continue to read and scrutinize numerous CSR reports, I will be watching for those Companies which mention the encouragement of appropriate CSR and sustainability education in their recruiting programs. It seems to me that a Company who is betting on a sustainable future ought to be concerned enough to support the business schools that are aligning themselves with this objective. Where is the divergent CSR ? I thought I had a pretty good command of the English Language. Now my vocabulary is enriched with terms such as Convergent CSR, Divergent CSR, mimetism, institutional isomorphism, coercive isomorphism, mimetic isomorphism, normative isomorphism (geez, don't these isomorphisms breed fast? ), causal ambiguity, rivalry mitigation and others that I am ashamed to admit I had never heard of. "Convergent CSR: Firms adopt practices that have already been adopted by rivals in the industry, or are within their reach, or collaborate with these rivals (and with stakeholders) to develop new practices that will be open to other adopters." "Divergent CSR: Firms try to use social performance to obtain comptetitive advantage; these firms want to be unique in their CSR practices and build barriers to imitation by rivals in order to protect the profits they expect from their position. " In other words, joining the club versus leading the pack. WIth Convergent CSR, firms are not trying to achieve a competitive advantage, but pursuing another objective. With Divergent CSR, the motivations are clearly related to business advantage. Nicola Misani offers six possible strategic reasons that Companies go the convergence route. These reasons include, yes, you guessed it - isomorphism in its various guises, the most basic being that "firms need legitimacy in order to attain their ends" and therefore choose to align themselves with the social perception of what is appropriate corporate behaviour. Another suggested reason is bandwagons - "responsible firms may be tempted to seek safety in numbers and emulate the practices adopted by their rivals". Another interesting reason is "rivalry mitigation" Nicola Misani claims that "socially responsible firms may not want to be too responsible" ie. they want to do just enough to gan the benefits but not enough to involve them in any risk. And more. Clearly, I cannot reproduce the entire article. You will have to buy the book...or buy the Chapter PDF download :). So back to the basic question. If a Company is going to adopt a CSR approach - why be content with convergence? A little more effort and divergence pays off. I once talked about CSR as a brand. The CSR program of a business having its own identity and core message, such as M&S Plan A, or GE Ecomagination, or Timberland Earthkeepers. These branded CSR programs are clearly divergent and they are also clear winners that I believe produce value for their moms and dads. Nicola Misani's analysis of the causes and consequences of convergent CSR is fascinating. And as this is a Reporting blog, I will end up by saying that, as I read CSR reports, I will be looking for evidence of divergence that will point to a more mature and sustainable way of doing business. Chunky Monkey anyone ? Only if you promise not to overdo the isomorphism. Voting has now commenced for the Global Reporting Intiative Stakeholder Council elections. The first round of voting takes place from 21st July through to 8th September. The Stakeholder Council is the GRI’s formal stakeholder policy forum, similar to a parliament, that debates and deliberates key strategic and policy issues. The SC meets annually and comprises a balance of stakeholder and geographic constituencies.Only GRI Organizational Stakeholders can vote in this election of members to the Stakeholder Council. My nomination to be a member of the GRI Stakeholder council has been approved. This is what I wrote as my reason for wishing to be part of this important group at a time when the status and evolution of reporting is more critical than ever. The GRI framework is a leading light in sustainability reporting and has critically changed the reporting landscape . As an Organizational Stakeholder for the past several years, GRI Data Partner and attendee at GRI conferences and events, and contributor to the GRI blog, I always do what I can to support the GRI. Together with my business partner, whose initiative it was to translate the GRI guidelines into Hebrew in 2006, we wrote the first GRI G3 report in Israel for a large banking client, and have produced several GRI reports since then, effectively leading the GRI presence in the local market. We have held 3 annual (GRI) reporting conferences in Israel, all attended by a GRI team member, the only conference in Israel focusing on reporting and transparency. We produce a Transparency Index for our local market, analysing the CSR transparency of the top 100 public companies with methodology inspired by the GRI framework. I believe all this demonstrates my commitment to the continued success of the GRI. Whilst I am committed and supportive, I am also critical. I have strong insights about reporting and the role of both the reporting process and the report itself, and how this should evolve. Whilst intuitively I support the notion of integrated reporting, I have strong reservations about how this can be developed in a way which is inclusive of all stakeholder interests , rather than focussing only on those who have a financial interest, and I would like to be involved in discussions leading the way integrated reporting will map out in future years. Whilst I see the need for robust assurance, I believe the current approach of the GRI on assurance is inadequate and would like to see changes made. There are many other areas in which I have a "supportively critical" view and believe I have much to contribute in a direct way, and indirectly through work I do to support reporting through all my various channels of interaction. I feel that my experience of the GRI framework and global mindset on sustainability will help me become a collaborative value-adding member of the Stakeholder Council. Thank you! So here it comes: If you are a GRI Organizational Stakeholder, PLEASE vote for me ! As CSR consultants working at a global level but based in a small, sluggish market from a CSR perspective (Israel) , we see our roles as much more than providing a service to clients who pay. We are on a mission to drive awareness and encourage as many Companies as possible to understand, adopt, excel at and benefit from responsible business practices, sustainability and transparency. After all, as CSR consultants, we also have a CSR reponsibility. Amongst the many activities we undertake in this respect, the flagship is the Beyond Business Annual Conference on CSR, Reporting and Transparency. For the past four years, we have organized a professional conference, free of charge, in the service of companies, academics, NGO's, students and professionals involved or interested in sustainability. (In 2009 there was a small nominal charge due to high costs of visiting speakers from abroad). This year, 2010, our conference took place on 19th July 2010. 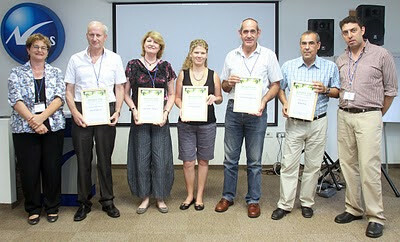 This year, we received support in the form of sponsorship from Bank Hapoalim and Discount Bank, two of the largest banks in Israel, each having published two CSR reports, and Ness Technologies, our clients, who hosted the conference in their impressive conferencing facilities in Tel Aviv and provided assistance with design elements and much more. We are grateful to these three Companies who helped us advance the cause. The conference was opened by the President of Ness Israel, Mr Effi Kotek, who stressed the importance of transparency, and the steps that Ness has taken in the past year to improve its corporate citizenship and reporting through joining the UN Global Compact and publishing a first Communication on Progress. Here you can see myself and my business partner Liad Ortar photographed with Effi. Review of global trends in CSR and Sustainability by myself, highlighting the use of social media, virtual conferences such as PR Newswire's Engage CSR 2010 at the end of last month, partnerships, Cause Marketing as the new philanthropy, CSR debates around the BP oil spill (obviously), the role of Walmart in leading change in supply change practices, the Global Reporting Intitative and strategy of partnering with the Carbon Trust, the UNGC and others for greater integration of approach to transparency and more. Update on the status of global reporting and key messages from the GRI Reporting Conference in Amsterdam in May 2010 by myself, followed by a short panel with Israeli participants Eynat Rotfeld from ECI Telecom, and Inbal Cinman of Ness Technologies, both CSR Managers in their respective Companies. A review of the value of SRI screening processes and the challenges of the different methods and indices which rank corporate sustainability for investors. A highly insightful lecture based on substaniated acedemic research by Dr Vered Doctori Blass, which was published in April 2010 in the Business Strategy and Environment Journal entitled "Measuring Corporate Environmental Performance: the Trade-Offs of Sustainability Ratings"
Presentation by Avraham Bar Ilan of Bank Hapoalim and the wide range of CSR activities conducted by this leading Israeli Bank, showing how good process and good communications are critical to embedding a CSR culture in everything from managing the environment, to offering preferential credit on solar installations, to supporting positive workplace practices, employee recycling initiatives and much more. 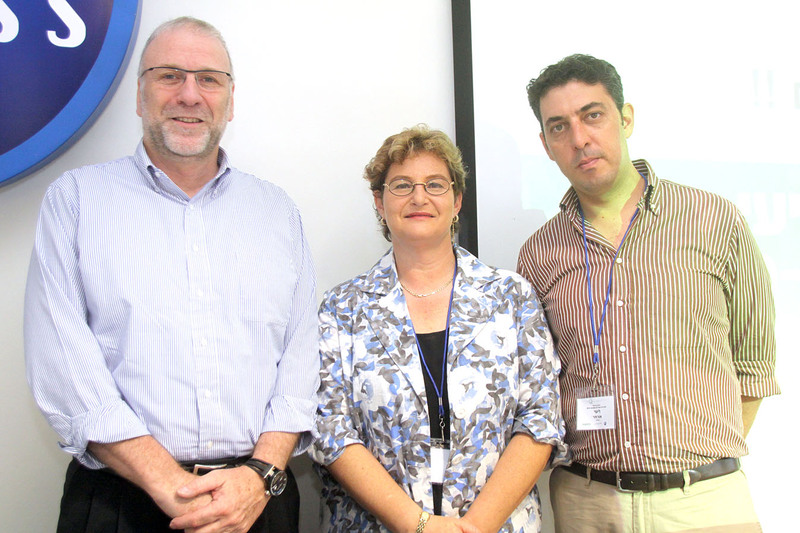 Illuminating presentation on the implications of Israel joining the OECD and the significance of responsible business practices by Ms. Lena Zeiger, the Director of the Multilateral Agreements Department at the Israeli Ministry of Industry, Trade and Labor. I am confident that this will be the catalyst that will finally awaken business leaders in Israel out of their CSR slumber. 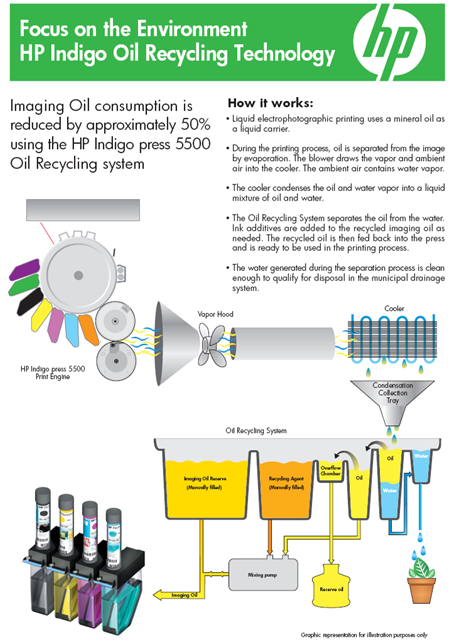 HP Indigo - the local digital printing arm of the global HP corporation - who has transformed digital printing processes to become significantly more environmentally friendly, presented by Yossi Rosen who heads up HP Indigo's Environmental Leadership programs. Mehadrin Tnuport - the largest grower and exporter of citrus fruits in Israel whose famous brand name Jaffa means quality and excellence. 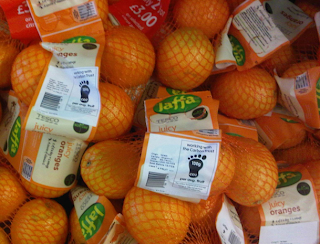 Mehadrin have undertaken a long process of Carbon Footprinting of oranges and grapefruits and other produce which represents groundbreaking progress. Lior Shmueli , our friend and colleage, presented on behalf of Mehadrin - Lior supported Mehadrin on this specific project, whilst we are working with Mehadrin on other aspects of CSR. Maccabi Health Services - the second largest heath services organisation in Israel presented their IPRA award winning project on expired-drugs collection and safe disposal, which was devised and supported by my partner Liad. 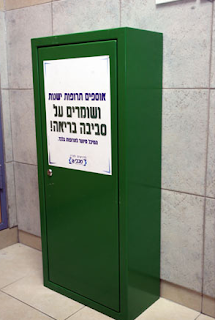 This was another groundbreaking project in Israel and significantly raised awareness of both the health and environmental dangers of random disposal of expired medication. Dr Nurit Friedman presented this project and demonstrated how this benefits not only society but also the organization through highly positive press and reputation value. The project research prior to launch showed that 80% of people simply throw drugs into their household garbage. All in all, this was a short but rich program and we are grateful to our sponsors, all the speakers, and all those who participated. We believe in getting the message through and were proud to have the opportunity to showcase leading clients and busineses in Israel who are moving our local market forward. One question from the audience was : How does a small business who is CSR-minded manage to make progress? My response was that there are many ways small businesses can make a contribution to a more sustainable world. As a small business ourselves, we are constantly engaging in activities whch advance the body of professional knowledge in our specialist areas of expertise - this conference being a prime example. It's hard, you have to devote time and energy to making things happen, but when you do, they happen! That's the thing about some words. The kind of sneak into daily use and then they become so widely used that their unique, valuable meaning is diluted and ultimately, lost. So it can be with "engagement". 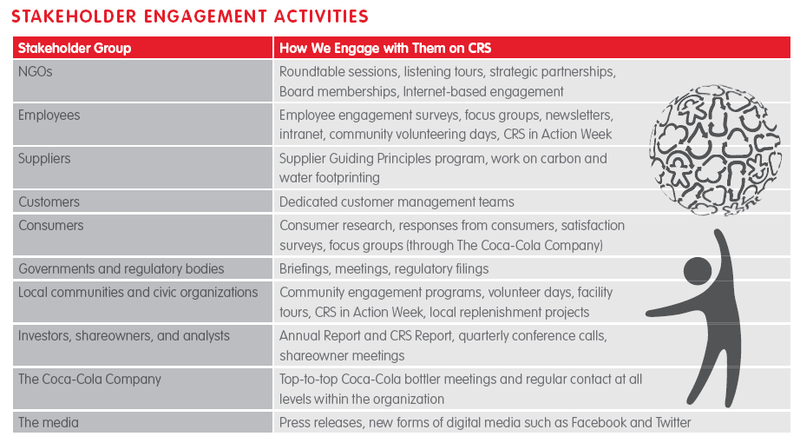 The particular type of engagement I refer to is "Stakeholder Engagement" as reported in CSR Reports. In listing stakeholders and the type of stakeholder engagement a Company undertakes, there are a number of common genericitis-infected statements which weaken the true contribution of the essence of "Stakeholder Engagement" in corporate reponsibility processes. Stakeholder Engagement is a focused, often structured approach to dialogue with stakeholders or stakeholder groups in order to ascertain stakeholders' concerns and aspirations relative to a particular business. It is a dialogue about corporate responsibility and the role of a particular business in society. It should be an insghtful, open exchange of views, needs, concerns, potential solutions and expectations. It is not any form of interaction or communication that happens to take place in the normal course of doing business. Bill Baue of Sea Change Media and Marcy Murningham of Harvard Kennedy School wrote a paper on the use of Web 2.0 Technology for enhancing Stakeholder Engagement - well worth reading if you didn't catch it when it was published a couple of months ago. You can also catch the interactive stakeholder engagement session video from the GRI conference where Bill Baue presents this paper. Whatever method you select to engage with your stakeholders, however, the reporting of this engagement is also important to drive credibility in your sustainability programs and reports. Irish Life and Permanent plc 2009 CR Report, under the heading "types of engagement"
Engagement with Suppliers: Our Group Procurement department meets suppliers in the normal course of business to agree contracts for supply of goods and services. Engagement with the media : Media relations and enquiries are handled by our media relations management consultancy firm. Hess Corporation 2009 Corporate Sustainability Report, under the heading "types of engagement"
Engagement with suppliers: Local content and mentoring programs, contract discussions and negotiations, trade shows and conferences, business to business communications. Engagment with industry associates : Trade and professional association activities, benchmarking. Volvo Sustainability Report 2009 under the heading "Stakeholder Dialogues"
Employees and trade unions: We all communicate with each other during daily work but also in formalized forums such as personal development plan discussions and yearly attitude surveys. All employees can pose questions directly to the Group’s CEO via the intranet. For top-down communication we often practice cascading from manager to manager. There are also other channels for information from the company to the employees such as: the intranet, in-house magazines, team meetings, films. Internally, we communicate in many different languages. We believe that open dialogue contributes to improvements. Suppliers: The Volvo Group works closely with suppliers. We value long-term relationships and the transfer of knowledge and understanding of each other’s processes, procedures and values. Forums for formal communication are our supplier portal, training sessions, dedicated supplier days and awards. 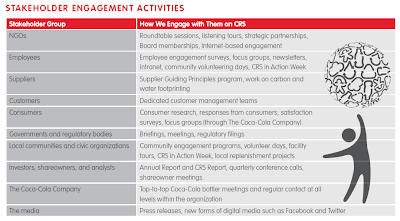 Exxon Mobil 2009 Corporate Citizenship Report provides 2 pages on stakeholder engagement with specific examples of engagement events around Corporate Responsibility issues, such as this example on page 10. Engagement with NGO's : We work with NGOs through a number of formal and informal channels. These include multistakeholder groups such as the Canadian Boreal Initiative and our own Expert/Stakeholder Advisory Group. We also meet with NGOs one-on-one to address specific issues or concerns. LG Electronics 2009 Sustainability Report includes a very detailed section on Stakeholder Feedback linkiing to a materiality analysis, and also report verbatim responses from external members of stakeholder consultation discussions. Very interesting! Stakeholder engagement is the ultimate proof of a credible and embedded approach to sustaianbliity. Companies who do not have the interest, courage, time or inclination to engage with stakeholders are not completely committed to sustainability principles. Assuming that you know what stakeholders think is not sustainable. It has to be a focused and specific series of actions. I believe comprehensive coverage of well planned and executed stakeholder engagement processes adds more credibility to a Company's reporting than an Assurance Statement, and untimately, of course, provides significant added value to the business. I was intrigued to read the news release of AHA! Sustainability Report. Intrigued because with a name like AHA!, you kinda expect something special, something well AHA!. CEO Betsy Henning says: "We wanted our first report to be as creative as we are and showcase the kind of strategic, engaging work we can do for our clients. We believe a sustainability report that is informative and also interesting will better connect with a wider audience. Rather than a document that sits on a shelf, it can be something people actually enjoy reading and learning from." Hmmm, sounds interesting. Can't wait. Race to open report. The AHA! Sustainability Report is one web page. Includes a little scrolling, I admit, but one page. My first reaction, being a critical scrutineer of sustainability reports (you know me by now) was 23-20-6 ! (that's code for a popular phrase which is inappropriate to write in a blog. Hint: 23 = W, 20 = T, 6 = F) . How can this be a report? But then I said to myself, "Elaine, come on, give it a chance." I answered myself. "OK Elaine, but you have to give me a Chunky Monkey reward afterwards." I agreed to these terms and started reading. As I progressed, I began to sense a certain authenticity and I warmed to the Company and what they are trying to do. AHA! is classified as a small business, 35 employees, one of the 48,158 similar sized businesses in the USA (a fact I learned from the AHA! report), and their story does reflect a genuine change in the way they run things, and a number of positive impacts. Whilst is not the standard type of report, not packed with the traditional data we might expect, skips sections that us reporters would normally include, and is far from the structure we have become familiar with, the storyboard gives a good insight into the kind of key impacts that a small business can control (environment, community, workplace culture) supprted by credible numbers. It's an inspiring read, actually, showing both how AHA! onboarded sustainability principles and benefitted the business at the same time. There are also interesting pieces of contextual data which explains some of their thinking against the backdrop of external factors. The presentation is fun - little text bubbles pop out as you read and interactive flags highlight interesting tidbits of information. I would certainly recommend the other 48,157 small businesses to read this piece. And yes, AHA! met my expectation of causing me to think AHA! As AHA! mature in their own sustainability efforts, they should start to move their thinking from direct impacts to indirect impacts - how to leverage their core business propsition to generate new value. What is it that a communications company can do best to advance sustainability? AHA! are doing some of this with significant increase in revenue (now 35%) coming from communicating their clients' sustainability. I loved the HP Changing the Equation 2009 Sustainability Report that AHA! worked on . Telling their own story is a great next step in this process. Moving forward, there is a natural progression that this punchy and creative company could follow to realise much greater business benefit and sustainability advances beyond recycling paper and cycling to work, that will make them even more sustainable. As HP says in their report: While the IT industry contributes 2 percent of global carbon emissions, the larger opportunity is using technology to lower the other 98 percent. In almost any business, the indirect impacts are exponentially greater than the directs. AHA! creatively show us they can do the 2% . But 98%, in their sector, is their real sustainability opportunity. Congrats to AHA! on an inspiring unreport report. It was my pleasure and privilege to be a speaker and participant PR Newswire's first Virtual Conference and Expo called Engage CSR 2010: The Growth of Corporate Social Responsibility in a Socially Connected World on June 30, 2010. The even had a fantastic agenda and speaker line-up. Brainchild of the brilliant effervescent and ever-positive super-connector Susan McPherson, this event surpassed everyone's expectations and raised the bar in virtual conferencing, bringing CSR closer to so many people around the world (over 1,000 registrants) in an efficient, environmentally-positive, easily accessible format. Engage CSR was truly engaging! The event is archived at http://bit.ly/cI3r2y for 90 days those who want to hear the presentations again. I participated in the panel called the Who, What, Why and How of Sustainability Reporting, moderated by John Viglotti of PRNewswire, and featuring co-presenters Mike Wallace, Director of the Sustainability Reporting Framework at the GRI, Michael Muyot, Founder and President of CRD Analytics, Maggie Kohn , CSR Director at Merck and Kevin Moss, CSR Director at BT. Mike and Michael talked about the importance of ESG information and the way investors now have greater access than ever before to non-financial data, and how this is used in evaluating companies.I then introduced the broader approach to Sustainability Reporting and how companies can go about it. Maggie and Kevin gave rivetting presentations about how reporting happens in their companies, the benefits and the challenges. For those who were not able to attend the event (make sure you don't miss the NEXT one!) , here is my presentation. Reporting is more than just a report. It's not just a compilation of facts and figures. It is designed not only to assist investors in how to evaluate the company's financial sustainability, it should tell the story of what a company does beyond making money. It has real value because many stakeholders, other than investors and the financial community, can view the report, and it influences them in making decisions about whether to buy from a company, whether to join a company, whether to support a company in the community and more. Not least, reporting is a tool for employees of the business to help them in their communications with everyone they interface with. Reports improve levels of trust in the business...if they are done well. Data from surveys proves this.Three elements of reporting well are Concept, Content and Communication. Reporters should first and foremost consider their report concept. Reports should tell a story – they should reflect the message of the company's sustainability purpose – the way the company is contributing to a better quality of life and environment though its business activities and sustainability program. Every company has its unique way of doing this. Each company should think about this key concept and reflect this in the way they write the report. It's not just about listing information and data. It's about pulling all the data together that supports the company's story. Vodafone's last report was called Mobilising Development . Their contribution is to advancing the quality of life in developed countries in through mobile technology. H&M's last report is called Style and Substance reflecting the fact that their contribution in the world of fashion is underpinned by a strong basis of sustainability performance. Campbell's last report takes the theme of nourishment – nourishing the planet, the community etc – building on their core business which is not just about making a profit on selling soup, but about contributing to the nourishment in people's lives. These are strong PR themes, and must be aligned with the core concepts and strategy of sustainability in the business. The content of a report should be the result of a broad team effort, which includes dialogue with external and internal stakeholders. It's no good if just the CSR manager or just a Communications Specialist writes the report. A wide range of internal departments must contribute to the content, and this content must be put in the CONTEXT of what external stakeholders expect. It should be structured in a way which both tells the story but also enables reporting against specific performance indicators, such as those defined by the GRI framework. The idea is not to run through a checklist of data items, but to embed the data in the way the story is told, providing a balanced perspective. It should not be just good news - the report should cover things that are challenging for the company. This has actually MORE positive value than just good news and ultimately is more credible. The content of the report should also be focused on the most important things for the business and for stakeholders. We call this materiality. The best reports include a MATERIALITY MATRIX which is evidence of structured thinking about the important issues. Ford, Centrica, General Electric, Vodafone, Dell, Sap, Allianz, … many of the best reporters include this and build their report around the key subjects noted as material. This avoids a report becoming what I call a shopping list and containing so much information that no-one can track or digest it, and becoming too unwieldy to manage. My view is that the report is a platform for communication. It's one document which contains all the material sustainability performance information about the company. No one single stakeholder or stakeholder group will be interested in everything. Each stakeholder group has a different standpoint and need for information and interest. The report should be a common demoninator of information needs, and communications with different stakeholder groups should build on this. For example, many companies produce an internal summary report for employees, or use podcasts, webinars, intranet, discussions etc to get them involved. Coca Cola Enterprises held anAction Week communicating CSR to their employees. Some companies produce exec summaries for investor meetings, or for customers, or for supplier conferences. The report should be the single comprehensive referential basis for all other communications. The other thing about the report is the format – a PDF download, an interactive website, a video announcing key highlights (which I recently produced for Coca Cola enterprises), a buzz on social media. Whatever format(s) you choose, you should leverage it in a targeted way. Communication should be two-way. You should invite and encourage feedback. The recent report from SAP has a feedback option on every page. AEP has videos and webcasts, Intel and Verizon and many more have blogs relating to their reports, all of which encourage open dialogue. The design of the report should also reflect the concept, but not overface the reader. In conclusion, a good report will have massive business and PR value, if it is written with a clear concept, relevant content and a sound basis for clear communication. This is no easy task and only very few reporters do it well. Look at some of my report reviews on CorporateRegister.com or Ethical Corporation to check out a range of different reports. Our role as stakeholders is to engage with companies to help them perform better and report better on sustainability. And engaging brings us back full circle to the CSR Expo Engage CSR 2010. There were many other fascinating presentations and conversations and many new contacts and twitter follow-backs. Well done to all who organized, all the tech team for great support, and to everyone who joined in the fun.